Just last week I came home from the Southern University Games that were held in Ballarat. Whilst footy was an option to compete in, I chose to become a part of the La Trobe Cross Country team for this years event. I’ve always loved running in competition, and running cross country has always been my favourite sport to compete in. I had a fantastic time with a great bunch of people in my team and from other unis also. The event itself was pretty easy, we only had two runs over four days. The individual 12km – two laps of Lake Wendouree – and then the relay, where four of us each ran 6km. I was a little unprepared over the longer distance, and felt myself really hit the wall after the first 9km. I felt pretty strong on the first lap, but I would’ve preferred a hill or two to climb and break some of the others down, and perhaps gain some advantage over the bigger, stronger guys. I finished 13th or something from about 20, definitely nothing to be ashamed of, but it was our team in the relay that I was most proud of. Being the slowest runner in the 4 man group, I was nervous when I had responsibility with kicking off the race, but like everything, once I came into rhythm, I was more comfortable. About 2kms in I broke away with the lead, and it was once I was by myself, I felt the great pressure to push myself and the team to a healthy lead. I’m not very good at all with pace-making, I much prefer to have someone running with me to push me further and sit on. But knowing that there were other runners after me, I pushed hard to break a big gap between me and our main rivals, Melbourne University. Their final runner, Smithers, is an absolute speed machine, coming first in the individual pursuit by a clear two and a half minutes, so we knew we had to have a huge buffer between us before we came to the last leg. I finished about 30 seconds in front of the RMIT runner, and the Melbourne runner was a further 2 minutes behind him. The others did their run and thankfully, we held on and came away with 1st place! There was only 30 seconds between us and Melbourne at the finish, a really tight margin when you consider the entire race took an hour and a half. Overall, the university actually took out the entire games. Gold medals came to the women’s tennis, men’s soccer, open lawn bowls, women’s basketball and mixed touch football teams. L.T.WHAT?!? L.T.U!!! Proud of our team’s achievements, I can add the title to the other winning cross country teams I have been a part of in the past. Actually, I’ve been quite lucky with my teams success over the years. My secondary school, Padua College, never lost a team cross country title whilst I was with them (nor have they for the past 25 years running! ), and even my Primary School, Mt Martha, were champions of our division each year. I’ve been pretty lucky with success when you look at it like that, but this latest victory is one I’ll remember for a while yet. Being part of a successful team is one thing, but being a successful member or player from that team is another aspect altogether. I have the feeling Joel Selwood would know what I’m talking about here. On the weekend, Joel played his 150th game for Geelong, and recorded his 124th victory for the side as well. Over his journey, he’s only experienced 26 defeats, and leads the competition for the highest win/loss ratio of current players (those who have played 150 games or more). Long suffering Richmond fans were once again biting their nails as they played Gold Coast up in Cairns on Saturday night. A scary late surge from the Suns didn’t prevail as the Tigers flew home after a greasy hard-fought 9 point win. It was the 3rd year that they had played a ‘home’ game up in North Queensland, and their first ever victory against Gold Coast, having lost their previous two by 15 and 2 points respectively. Richmond’s 6.17-53 was their lowest winning score since round 3, 1995 where they scored 4.16-40 to Hawthorn’s 5.4-34. Both teams total of 97 was the lowest aggregate score Gold Coast has ever played in. (Previous: 106 in R8, 2012 vs WB). Amazingly, both teams kicked the same amount of goals, and both have each won 6 quarters in the 3 contests between the two. Richmond will be thankful that they didn’t drop this game, as they remain in 6th position with 10 wins and 5 losses. Gold Coast have slipped down one spot to 14th on the ladder, just 2 games behind 2010 premiers, Collingwood. The other game in Queensland, on the very same night, was Brisbane’s home game against North Melbourne at the Gabba. The Kangaroos proved yet again that they were unable to close out a comfortable lead, after they gave way to a 33 point lead late in the third term, to be defeated by 12 points. And their 5th loss this season after leading at 3/4 time. Another close loss for the Roos, meant that it was the 7th time this year (from only 16 rounds!) that the team has lost by less than 3 goals. Both teams combined 8 behinds was an incredible nod to accurate kicking, equal 12th least behinds in the history of the game. North Melbourne will be wishing they had their time again as they have lowered down a spot to 11th on the ladder, on the same amount of wins as Brisbane on 13. North’s healthy percentage of 116.1% to the Lions 80.3% is the difference. In the 4th ‘Battle of the Bridge’, so titled between the Sydney Swans and Greater Western Sydney Giants, the reigning premiers hosted the wooden spooners for the first time at the SCG. On a sunny Sunday Afternoon, the Swans registered 8 behinds before their first goal, but once they hit their stride, they were unstoppable, running out 129 point victors. It was the Swans largest win over the Giants in the 4 previous contests, and the team’s highest winning margin since 130 against Wet Coast in Round 16, 1987. It was their 5th biggest win in 116 years. The Swans had 13 individual goal-kickers, where their record is 14 (R4, 1991 v RICH at MCG and R21, 2012 v WB at DOK). And their 51 scoring shots was the 3rd highest for the club as well (Record: 56 v Essendon in R17, 1987 at SCG). Sydney’s 77 forward 50 entries was their highest recorded total since this stat began a couple of decades ago, and was the equal 8th highest tally ever. The team’s 31 marks inside the 50 was also the 7th highest on record. The Giants struggled after losing key on-baller, Tom Scully early in the piece and managed only 5 goals for the entire match. Their 7th lowest score ever, and lowest this year. It was also the 3rd biggest loss the Giants have received. The Giants are still winless at the bottom of the table, whilst the huge win for Sydney boosted their percentage from 131.6% to 142.2% and holding their position at 4th on the ladder. In the other cross-town Derby (or Daarby?) West Coast hosted Fremantle for the 38th time. A close game at 3/4 time was blown out by the Dockers in the final term as they recorded a 28 point win, in their 17th victory over the Eagles. Bragging rights remain with Fremantle, it was their 3rd successive win in the Derby, and the first time they have scored 3 consecutive centuries against West Coast. Fremantle’s hailed defence held up well again, keeping West Coast’s score under 100 for the 13th consecutive time. West Coast’s Mark Hutchings laid a courageous 16 tackles, equal 3rd highest amount from any player in a single match. As Rogers Results points out, Fremantle’s run at Subiaco this year has been 8 wins from 9 games, whilst West Coast has experienced only 2 wins from their 8 games. Earlier this year in round 1, Fremantle beat West Coast by the same margin of 28 points, 16.12-108 v 11.14-80. Fremantle continue to hold on to their 5th position, equal with Sydney on 46 points, but trailing by 15.9%. The Eagles drop a further place down to 10th, a win and percentage below Port Adelaide in 8th. 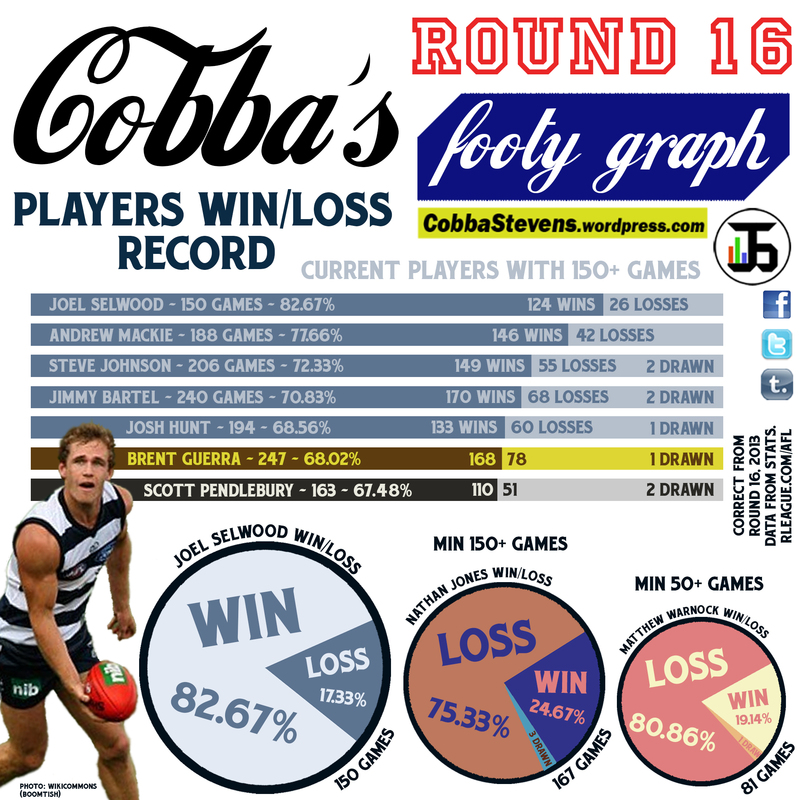 Geelong’s Joel Selwood would probably argue that his overall win ratio of 82.67% is much more substantial. As I mentioned before, his victory on the weekend in his 150th game meant that he has had the most successful first 150 games of any player ever. Being a part of Geelong’s 2007, 2009 and 2011 premiership sides puts Selwood in probably the best lineup of the past decade. But to keep his position within such a successful team, Selwood needed to perform. And he has done so very nicely. He won the 2007 Rising Star, 2010 Geelong Best and Fairest and named within the 2009 and 2010 All Australian team. As far as win ratio is concerned, few players have seen a better run in any stage of their career. Briefly, in round 13, 2009, after his 58th game, he had only seen 4 losses, meaning his win ratio was at 93.1%! Since the 2010 and 2012 seasons, this total had dropped off, yet still at a very high rate. Teammate, Travis Varcoe has the highest percentage of any current player (with 50+ games). The career of turn of Gary Ablett has been an interesting one since his departure from the Cats. Selwood a champion of the game and easily the game’s best player. All who say otherwise are envious of the quality of the man and his ability. Always fascinating stuff and welld oen on eth relay. I don’t think Scully has played 50 games yet but I imagine his ration is pretty poor. Do you know what it is? What about Watts and Trengove, also imagine many losses. Lucky time to be a Hawks recruit in recent years, looking at stats for Bruest, Smith and Puopolo. Would also like to see Spider Everett’s stats, every team he was at seemed to be lusy when he was there, and improve after he left! Finally, more homework, what is the Judd comparison pre and post the move to the Blues? Actually North have only lost 4 this year (by round 16) after leading at 3/4 time. Yes, sorry Michael! Realized that mistake before and forgot to edit. Thanks for pointing it out. Joel Selwood is an absolute gun but in my humble opinion Scott Pendlebury is a more pure footballer and his skill, poise and ability to create space in the hottest of traffic, as opposed to Selwood’s hard-running and bash/crash style, is of the highest order and is compulsory viewing. But I would be splitting hairs. What does a draw do to the percentage. Does it increase, decrease or stay the same. To go apparently one -out here , though Selwood is a great player , i hate the way he plays to draw free kicks. He doesn’t need to , being such a good player anyway , and he shouldn’t do it. Of course he ‘s not the only one that plays for frees , he’s the best at it though. It’s not in the spirit of the game and shouldn’t happen . They’re Australian footballers , not English cricketers.